The first websites that work began to pay via online, are known as Elance and frelancer . 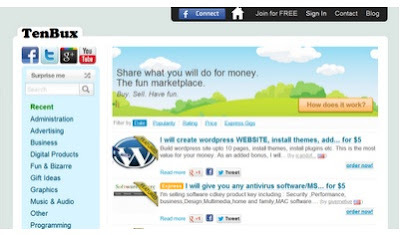 So Fiverr began copying the basics of these great platforms to become one of the main today. If you are a professional and know their job coping, Fiverr is one of the best options out there today for work via the internet and be independent. But if you do a job for the website Fiverr , this will only pay $ 5 for each job, other than that the platform Fiverr will take a commission of 20 percent of their work is equivalent to one dollar off your salary $ 5. For this reason is that many websites have sprung up to give them a better way to make money. For the success of Fiverr over the years, many websites have adopted the idea and created their own versions of Fiverr , but most of these websites are not as good, therefore I will post the top 10 websites that are the best alternative to no longer be exploited by Fiverr. Why not use the platform Fiverr? Okay by me are some legitimate reasons that I will explain clearly why not use this type of platform known as Fiverr. First does not pay well. I know people who work for Fiverr via internet from home make hundreds of dollars each month, but they must work too hard to earn some money. Secondly you will not even be able to win the $5 bill that is what they are paid in this website, because the platform Fiverr will charge you a commission of 20 percent for each work you do within this site web, so you not only receive $4 more, but for every job. Just imagine that you complete 200 jobs in a month, you will only receive $800 and the platform Fiverr will take $200. Do you see injustice?. The person who suggests professional websites names, probably a beam in this work. Since it can take 10 minutes just to get to a good name and a good motto. However, the web designer has to work for hours, just for a paltry $ 4. I remind you that both boys earn the same. The point is not that long delay or do it in 10 minutes, the point is that this website operates much to people and it is for this reason that today I will show you the 10 alternatives have to be no longer exploited and to have a decent job on the Internet. 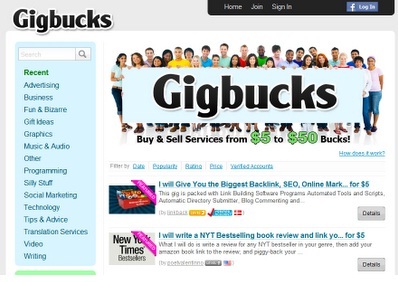 GigBucks is a very popular alternative to Fiverr . Which offers all the categories found in Fiver r. This website gives autonomous services and gives the opportunity to collect an adequate amount of money for their services. A study in the platform GigBucks can cost between $ 5 to $ 50, this is definitely a big step up from the $ 4 that would have won on Fiverr . Like Fiverr , registration is free. And you can apply to different jobs that are tailored to you. The website Zeerk is another option to earn money online . The t ork in the platform Zeerk can be very good for many people . On this website you can earn up to $ 100 per job ! , the services of this platform can pay appropriate fees for you! This service is also used for small jobs such as you earn between $ 2 and $ 5 per Zeerk work , and there is no commission . SEOClerks The website is one of my favorite websites. already having work related as: SEO, Internet marketing and other web services . This platform offers a wide range of jobs and services, there are jobs to a dollar, and there are jobs that you can expect to pay between $ 900 fine for each project undertaken within this platform that is extraordinary. Simply visit and see I'm talking about. TenBux web page is very similar to Fiverr . In u na is almost as much . has one interface similar to Fiverr , that is simple and easy to use . has almost all categories of Fiverr . The only difference is large , which enables you to earn up to $ 10 for each job, the double of what you would Fiverr . Of the $ 10 you earn will share 20 percent with TenBux platform and you will receive only $ 8 in net profits. The Dollar3 website is much better than Fiverr as it has some alternative jobs. Firstly, this website pays through PayPal and AlertPay . Here, you can get jobs in different prices as $ 5, and some other multiples of 3, $ 3, $ 6, $ 9, $ 12, $ 15, $ 27, $ 45 and $ 90. Not bad huh? Sign up now and you can show the world how talented you are. 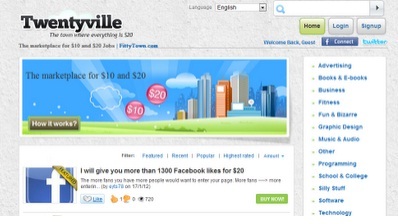 Another good option is the site TwentyVille web is a good alternative for online jobs . 's website or f read more profits than Fiverr . Now you can organize all kinds of jobs within this Magni fica platform , and can earn from $ 10 to $ 20. The commission charged that remains the same as previous web pages spoken at a discount of 20% . So you also receive only $ 8 or $ 16 net profit. Yet, it is better that the website Fiverr . 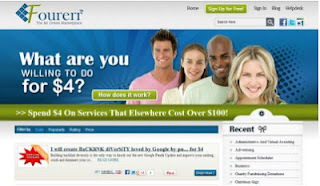 The silver Tenrr form is a copy similar to Fiverr . However, the interface is a bit similar. The good thing is it has a lower commission rate than Fiverr . Which allows you to post jobs ranging from $ 1 to $ 10. So that is very useful in terms of categorizing jobs online. But the problem here is that employers have jobs with ever lower rates to attract customers. And I must say, that $ 1 is too low for any kind of work, unless you try to suggest a business name or slogan or something. 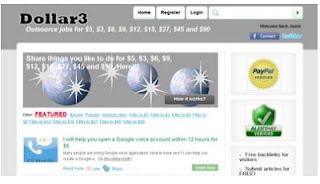 The website GigMe5 is similar to the silver form Fiverr . Since l to interface works very similar . And the services are the same also. On this website you will only pay $ 5 for each job , and like Fiverr you deducted the 20% commission, etc. The website Fourerr is very similar to Fiverr . Only , I will offer $ 4 for each job . And the commission rebate is equal to 20 percent, the payment is made ​​via interface PayPal . 's not better than Fiverr , but definitely worth a shop around this website . This whole post a treatise on the 10 best alternative internet jobs without using the platform Fiverr . Any questions or suggestions do not forget to send me an email or comment and I will answer you immediately. I would say that fiverr’s got a great competitor. I’ve used fiverr and several other microjob sites like, fiversworld, tenbux, tenrr and so on, but I’ve never seen a site that can compete with SEOClerks. My guess is that Fiverr still has tons of more visitors than all other sites, but I believe that thousands of people will be joining SEOClerks in the nearest future. Did you check their new look? Its incredible!